Fra Filippo Lippi, sometimes called Lippo Lippi, one of the most renowned painters of the Italian quattrocento, was born in Florence -- his father, Tommaso, being a butcher. His mother died in his childhood, and his father survived his wife only two years. His aunt, a poor woman named Monna Lapaccia, then took charge of the boy; and in 1420, when fourteen years of age, he was registered in the community of the Carmelite friars of the Carmine in Florence, Here he remained until 1432, and his early faculty for fine arts was probably developed by studying the works of Masaccio in the neighboring chapel of the Brancacci. Between 1430 and 1432 he executed some works in the monastery, which were destroyed by a fire in 1771; they are specified by Giorgio Vasari, and one of them was particularly marked by its resemblance to Masaccio's style. Eventually Fra Filippo quitted his convent, but it appears that he was not relieved from some sort of religious vow; in a letter dated in 1439 he speaks of himself as the poorest friar of Florence, and says he is charged with the maintenance of six marriageable nieces. In 1452 he was appointed chaplain to the convent of S. Giovannino in Florence, and in 1457 rector (Rettore Commendatario) of S. Quirico at Legania, and his gains were considerable and uncommonly large from time to time; but his poverty seems to have been chronic, the money being spent, according to one account, in frequently recurring amours. Vasari relates some curious and romantic adventures of Fra Filippo, which modern biographers are not inclined to believe. Except through Vasari, nothing is known of his visits to Ancona and Naples, and his intermediate capture by Barbary pirates and enslavement in Barbary, whence his skill in portrait sketching availed to release him. This relates to a period, 1431-37, when his career is not otherwise clearly accounted for. The doubts thrown upon his semi-marital relations with a Florentine lady appear, however, to be somewhat arbitrary; Vasari's account is circumstantial, and in itself not greatly improbable. Towards June 1456 Fra Filippo was settled in Prato (near Florence) for the purpose of fulfilling a commission to paint frescoes in the choir of the cathedral. Before actually undertaking this work he set about painting, in 1458, a picture for the convent chapel of S. Margherita of Prato, and there saw Lucrezia Buti, the beautiful daughter of a Florentine, Francesco Buti; she was either a novice or a young lady placed under the nuns' guardianship. Lippi asked that she might be permitted to sit to him for the figure of the Madonna (or it might rather appear of S. Margherita); he made passionate love to her, abducted her to his own house, and kept her there spite of the utmost efforts the nuns could make to reclaim her. The fruit of their loves was a boy, who became the painter, not less celebrated than his father, Filippino Lippi. Such is substantially Vasari's narrative, published less than a century after the alleged events; it is not refuted by saying, more than three, centuries later, that perhaps Lippo had nothing to do with any such Lucrezia, and perhaps Lippino was his adopted son, or only an ordinary relative and scholar. The argument that two reputed portraits of Lucrezia in paintings by Lippo are not alike, one as a Madonna in a very fine picture in the Pitti gallery, and the other in the same character in a Nativity in the Louvre, comes to very little; and it is reduced to nothing when the disputant adds that the Louvre painting is probably not done by Lippi at all. Besides, it appears more likely that not the Madonna in the Louvre but a S. Margaret in a picture now in the Gallery of Prato is the original portrait (according to the tradition) of Lucrezia Buti. The frescoes in the choir of Prato cathedral, being the stories of the Baptist and of St. Stephen, represented on the two opposite wall spaces, are the most important and monumental works which Fra Filippo has left, more especially the figure of Salome dancing, and the last of the series, showing the ceremonial mourning over Stephen's corpse. This contains a portrait of the painter, but which is the proper figure is a question that has raised some diversity of opinion. At the end wall of the choir are S. Giovanni Gualberto and S. Alberto, and on the ceiling the four evangelists. The close of Lippi's life was spent at Spoleto, where he had been commissioned to paint, for the apse of the cathedral, some scenes from the life of the Virgin Mary. In the semidome of the apse is Christ crowning the Madonna, with angels, sibyls and prophets. This series, which is not wholly equal to the one at Prato, was completed by Fra Diamante after Lippi's death. 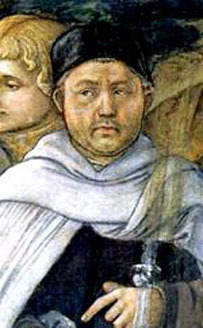 That Lippi died in Spoleto, on or about the 8th of October 1469, is an undoubted fact; the mode of his death is again a matter of dispute. It has been said that the pope granted Lippi a dispensation for marrying Lucrezia, but that, before the permission arrived he had been poisoned by the indignant relatives either of Lucrezia herself, or of some lady who had replaced her in the inconstant painter's affections. This is now generally regarded as a fable and indeed a vendetta upon a man aged sixty-three for a seduction committed at the already mature age of fifty-two seems hardly plausible. Fra Filippo lies buried in Spoleto, with a monument erected to him by Lorenzo de Medici; he had always been zealously patronized by the Medici family, beginning with Cosimo, Pater Patriae. Francesco di Pesello (called Pesellino) and Sandro Botticelli were among his most distinguished pupils. In 1441 Lippi painted an altarpiece for the nuns of S. Ambrogio which is now a prominent attraction in the Academy of Florence, and has been celebrated in Robert Browning's well-known poem. It represents the coronation of the Virgin among angels and saints, of whom many are Bernardine monks. One of these, placed to the right, is a half-length portrait of Lippo, pointed out by an inscription upon an angel's scroll "Is perfecit opus." The price paid for this work in 1447 was 1200 Florentine lire, which seems surprisingly large. For Germiniano Inghirami of Prato he painted the "Death of St Bernard", a fine specimen still extant. His principal altarpiece in this city is a Nativity in the refectory of S. Domenico -- the Infant on the ground adored by the Virgin and Joseph, between Sts. George and Dominic, in a rocky landscape, with the shepherds playing and six angels in the sky. In the Uffizi is a fine Virgin adoring the infant Christ, who is held by two angels; in the National Gallery, London, a "Vision of St Bernard." The picture of the "Virgin and Infant with an Angel", in this same gallery, also ascribed to Lippi, is disputable. Few pictures are so thoroughly enjoyable as those of Lippo Lippi; they show the naivet� of a strong, rich nature, redundant in lively and somewhat whimsical observation. He approaches religious art from its human side, and is not pietistic though true to a phase of Catholic devotion. He was perhaps the greatest colorist and technical adept of his time, with good draughtsmanship -- a naturalist, with less vulgar realism than some of his contemporaries, and with much genuine episodical animation, including semi-humorous incidents and low characters. He made little effort after perspective and none for foreshortenings, was fond of ornamenting pilasters and other architectural features. Vasari says that Lippi was wont to hide the extremities in drapery to evade difficulties. His career was one of continual development, without fundamental variation in style or in coloring. In his great works the proportions are larger than life. Along with Vasari's interesting and amusing, and possibly not very unauthentic, account of Lippo Lippi, the work of Crowe and Cavalcaselle should be consulted. It should be observed that Crowe and Cavalcaselle give 1412 as the date of the painter's birth, and this would make a considerable difference in estimating details of his after career. We have preferred to follow the more usual account. The self-portrait dated 1441 looks like a man much older than twenty-nine.